Where do I begin… ? Regular listeners will know that I often rant about timid design, dog-walker specific models, everything-in-black, the big-box-brand stranglehold on the market ruining the choice for everyone and spoiling our fun. We all know the brands that come to mind, the ones we see in Blacks, aye, I widnae be wearing that stuff. Cast your mind back to the Berghaus Big Wall range. A comprehensive and detailed range of kit for folk climbing vertical granite and sleeping on portaledges. I said many derogatory things about it, but someone said to me a while back that it was Berghaus showcasing that they’re not a High Street brand, that they have a superb technical heritage and that they still produce top-end cutting edge kit. Had I missed the point? And, an opinion is only as good the experience it’s based on, and given that the outdoor trade updates itself twice a year, anything I had to say about Berghaus was out of date. Aye, that’s where the grin started. Above we have the Temperance Jacket, a Gore-Tex Pro Shell, alpine-style waterproof from the top-end Extrem range. 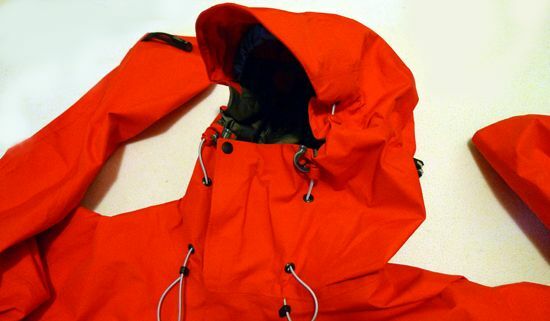 It has the multi-adjustable Raptor Hood System, two venting chest pockets, full length front zip, non-elasticated velcro adjustable cuffs and a Rentex collar section at the back of the neck which is a bit “felty” and nice against the skin, and it adds a little stiffness to the rear neck area of the hood, acting as a collar of sorts. All the zips are water resistant, but have storm-flaps, with the main front zip having velcro patches on there too. The rear hood and hem drawcords are split into halves, so you can fine tune the tension front/back or left/right or just pull them together if that’s what you like. The only other jacket I’ve got with this arrangement is the Claw 2 from Furtech. The Raptor hood allows tension to be adjusted separately across your forehead and the sides of your face, so you can close up the front and not squeeze your hat into your forehead for example. But more importantly the hood, which is huge for helmet wearing, closes up very neatly around a bare head without any real fabric bunching and moves well with your head too. The peak is big, stable and wired. I have to say that this hood is superb, I’ve instantly taken to the shape and the level of protection it gives. The adjusters are even chunky types so you can work them with gloves on. That theme carries through the whole jacket, simple and functional, even the rubber adjusters on the cuffs that I usually hate have enough of a non-velcroed surface at the ends for me to get a hold of them easily. The arms are nice and long, and the hem doesn’t move when I swing my arms around in circles. The body is slim, a good fit over a light midlayer, and will take a light synthetic insulation layer as well if needs be. It’s a very “British” mountain jacket with the storm-flaps and the big hood, but it’s also very modern in the clean design and the light weight. It’s short as it’s a climbing jacket (it does have a scooped rear though), but that’s an acceptable trade-off to get the benefits of the rest of it. I really like the feel and the look of the Temperance. The Spectrum Micro Half Zipis a simple pullover. It’s cut from AWL 100 weight fleece which feels a bit like the Tecnopile Micro that Jack Wolkskin use on their Gecko, or a maybe finer version of that golden oldie, Karisma. Whatever, it seems to have a little more wind resistance than the usual suspects from Polartec, but we’ll see about all that stuff when it’s been oot and aboot. It’s got a decent length front zip, a single wee pocket, long arms and body and neat cut. It’s not slim, but not casual either. Comfy, good arm movement too. Looks like a nice all-round piece. The Arete 35pack is also from the Extrem range. It’s an uncluttered climbing/daypack with a low profile harness, elasticated wand/bottle pockets, elasticated chest strap with whistle buckle, ice axe/pole carrying fittings, hydration compatibility, a flexible back system that will still stop stuff sticking into your back and the brilliant reverse-style waist belt (you pull it tight from the hip fins towards the front). 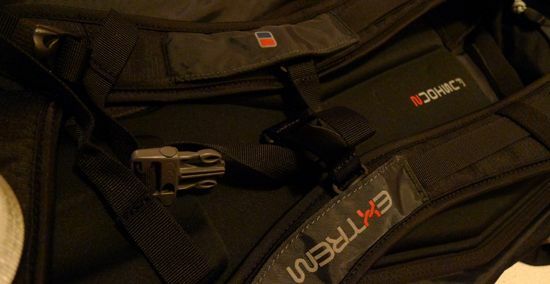 The buckle is even a push-through type that I loved on the old Karrimor packs. I’ve loaded it up and the back length is good on me, if feels stable and I can reach back to the pockets too. It’s got top-tensioning straps which seems odd on a 35L pack these days, but it might be that the pack shape means a different load position than I’ve been used to recently, and I’ll feel the need to pull a fully loaded pack in on a steep descent or something. We’ll see what happens there, they might just be there due to force of habit?! It’s neat, light and has nice wee ice-axe clips. I’ve been asked many times to compare this pack to the OMM Jirishanca, and like I said to Berghaus, I feel duty-bound to try one. So we shall see. Last up is the Chulu Vest. A nice little insulation piece filled with Primaloft ONE Eco and with an AF Nylon shell. It’s got two zipped hand warmer pockets, a high chest pocket and another internal pocket. The hem is adjustable and the arms holes have lycra binding to seal in the heat. This is one of those bits of kit that ends up getting used for everything as it’s so handy, great on the hill at rest stops or on the move in the cold, great at camp, great for just cutting about on cold days because you can carry stuff in it and it’s not a big fat down vest which can sometimes make you look a bit conspicuous. We’ll see a lot more of the Berghaus kit in the near future, and I’ll tell you it’s going to be no hardship using this gear. The fit, the features, the weight, the fabrics, it looks like all the components are in place. We’ll see. Hmm, am I eating my metaphorical hat here? More soon. This entry was posted in Kit Reviews and tagged gear. Bookmark the permalink. Please fill us in on the Eco credentials (or not) of some of this gear as well please if you can, that helps in the comparison too. Welcome to my world Pete! Bought a Temperance in TKMaxx for just £73 in the clearance bit… mainly due to being BRIGHT yellow and well hidden in the wrong section (by my good self oops), they were trying to sell it for £120 previously. The hood is as you say, an amazing piece of kit. It synches up to both a helmet or head with the same ease, turns well with both and has to be the best hood I’ve ever tried. Been in some right blizzards over xmas and with a set of goggles I was weatherproof. I like the fact their are no pit zips, the pockets/vents do what they are meant to- as in vent properly, it doesn’t ride up at the back, arms are long enough so that even if you have them above your head they don’t pull the back of the jacket up. Velcro on cuff can pass ‘tween finger and thumb to pull sleeve lower whilst walking… this is good. Even the colours are proper BRIGHT! Really quite like the look of that smoulder hoody as well… seems to make a lot of sense. Interesting stuff. One of my favourite bits of kit is from Berghaus – the 64zer0 sack, now sadly discontinued. It’s perhaps a little sloppy if you wanted to run with it, but for walking I find it really comfortable and has stood up to several years of heavy (ab)use. Couldn’t quite get on with the Arete (45), though. I must confess that these days I usually associate Berghaus with the high street rather than technical stuff, but there must be some good kit around if Leo Houlding etc are happy to use it. I absolutely have to do this stuff, I have to test the brands that are unfamiliar. As I always say, I love to be proved wrong, because if I’m not learning it’s all a bit pointless. It really was a rush unwrapping this kit, I had no idea what my reaction was going to be. And as Berghaus know me and my words, they still sent me the kit, that showed confidence in the product, fair play to them. Moggy, the Smoulder was on my wish-list along with the kit above. Stock and size availability, suitability, always plays a part on what turns up. It does look good though. The Spectrum is actually a good choice as it’s not overly technical, juat a simple fleece, I don’t have much of that! Soularch, The Primaloft is the ECO variant which is 50% recycled content, and I know Berghaue broke ground by going with 100% recycled Polartec a while back. But it’ll interesting to see where they are in a general sense. Mr Chewy, well done, yellow as well! Good to hear that it’s looking good for out in the field too. That hood just rocks. Rambling Man, that’s exactly what I’ve done for the past few years, seen Berghaus as the brand that architects wear on site visits, or the vision of neds in their Mera Peaks came to mind. I’ll tell you though, their website doesn’t help their cause. The photies make the gear look bland and it’s easy to miss the good stuff the way it’s layed out. This is really interesting for me, it’s newness to the max! Most of their tech stuff has been passing me by, and I’ve probably missed a lot of good kit. Still, it’s been good to have such a surprise while playing catchup. Hmm yes, their website isn’t great – it’s the words rather than pics that dull me. It’s also a bit lacking in details – fill weights and even total weights for several of their insulation pieces seem to be missing, another reason I tend not to consider them seriously. One thing there that did catch my eye, though, was the Incinerator “duvet”. Again no weights are given, but it looks like it’s pretty warm (and heavy? ), so why the primaloft on top of down? It’s an interesting concept at first thought, but at the sort of temps that jacket seems to be aimed at, wouldn’t down would be happy on its own? And surely it’d be much more versatile and useful to have a down vest and synthetic jacket combo (or vice-versa) if you really needed both? In all honestly i think berghaus have been through a form over function period and have churned out rather a lot of average or expensive stuff. Aye, the website is very light on info or inspiration. One huge paragraph on the Temperance jacket page deals with the dark marks you can get on light coloured shell jackets, it places so much emphasis on it that it feels like a sign saying “Don’t buy this jacket”. The Incinerator? Odd isn’t it, I can see why they tried to do there, but?! I’ll have weights and prices when I do upates on the kit, I’m getting more organised now! Aye Moggy, I’ve got Brasher boots here now, Lithium GTX’s. I’ll get them up soon. More stuff incoming too, and I’m spending Monday and Tuesday next week in the Lakes doing showroom vitits. It’ll be gear armageddon in here! ok you know what i’m going to say….. all looks quite good, clicked on the links, click on the women’s range and what do you get? Something that looks like someone from dullville has approved it. Sorry the colours are again crap for women. For example, the chulu vest in that yellow above looks absolutely smart as anything. Women’s version comes in black and err Amethyst! which is that horrible berry colour that is somewhere between burgundy and nowhere-near-purple. The first page of womens jackets provides shadow-blue – ugh, black – ugh, ugly berry, the only saving grace is the nice red. Apart from that I do have a pair of Statis trousers that I’m not sure they do now (they are/were in the Extrem range). Cordura fabric. They are a good fit and even came in the short leg which is ace for me! And i can testify that after 2 weeks wearing through dust, sweat, tears and snotters my Spectrum Micro full zip fleece performed very well on the trek. I like the slim fit of mine’s too, it’s not a baggy fleece like some others. This I have in black. It’s cool though. has there been a spike in apparel and gear prices recently? Ange, I confess to not having looked through the wummins gear, the website is too unwieldy. If I get a workbook in I’ll report if there are better colours and options that don’t get made becauae the stores don’t order them. Holycow, aye there will have been. New season, plus the VAT increase will have see everything go up a bit. But the news is that there’s won’t be another similar hike this year, productions costs have stabilised again. I’ll need to check out the pantrousers, oh yes, that’s a word. The Lithiums are a big surprise, a narrower, more “Euro” fit than I was expecting, a neater heel cup too. The outsole rubber feels quiet hard, so they could be going for durability over ultimate grip. The feel pretty good though, I’ll have more on them soon. Aye, news folk standing in the rain in roll away hood Berghaus waterproofs. I wonder which does the most harm to the brand image, that or Leo?! The whole pack seems high up my back as well, I reckon it’s a design ethos thing, and that’s why it’s got the top tensioning straps. I’m fitting a bungee “web” to the front panel of mine, there’s nowhere to stick my Snowclaw!